nesdev.com • View topic - Legality of the snes font? Legality of the snes font? Post subject: Legality of the snes font? Recently a new Megadrive/Genesis game Tanglewood was released. Something that caught my attention of the campaign was how the author wanted to make the release as legal and as "official" as possible. To the point where he contacted Sega directly and filed for an official rating. In the process, he was advised to avoid using the exact Sega logo / Megadrive logo on the box art and catridge label. How come? Is this the same case for Nintendo? In specific, I'm curious about the snes logo and font. Sorry if this thread deviates from "snes dev". Last edited by olddb on Thu Oct 04, 2018 4:31 pm, edited 4 times in total. Post subject: Re: Legality of the snes font? Trademark law is different from copyright. Trademark law requires active enforcement on the part of the trademark owner, and they are legally obliged to tell people to stop using it to prevent loss of the trademark. If they aren't willing to license the trademarks (and there's no obligation for them to do so, and there's valid reasons they may well be unwilling to license them for new retrodev), their only recourse it to tell/force other people to not use it. This is different from actual typefaces used in print or games that are not part of a trademark: in the US, fonts have been deemed "too utilitarian" to be eligible for copyright, although modern vector fonts (e.g. TTF) have copyright on the embedded supplementary program inside them. In the EU, however, fonts are eligible for copyright. As for trademarks: Nintendo still sells the Super NES Classic Edition, with trade dress closely resembling that of the Super NES during its commercial era. Exclusive rights in the design of a typeface, as opposed to its embodiment in a scalable font file, most closely resemble design patents or registered designs. They last 15 years in the United States, or 25 years in Britain (source) and the European Union. I'm more interested in exactly what typeface is used for each Nintendo platform's branding. I know "GAME BOY" is some weight of Gill Sans Italic. Ok. So if I understood you correctly, the actual "supernintento" red logo is most likely still under trademark by nintendo, but the actual "red letter font" used is not in the USA? So, someone could publish a label with that same font as long as the end product is distinct enough from the official trademarked red logo? In the UK this is a grey area? The font is probably something off the shelf, if it was commissioned by Nintendo then it would be off limits. However writing Super Nintendo in said font is 100% going to get you take as you use Nintendo which they own. Writing Super Wonderthing in red, fine. 100% going to get taken. Independently, the full logo is assuredly covered by trademark. Basically, if you use any portion of the logo (the Super Famicom circles, the SNES 'condensed text above reverse text') in a manner that is sufficiently similar to the original logo that a person will recognize it as a reference to the original logo, and it's being used in a context that could insinuate endorsement ... it's probably trademark infringement. Is something like this good? Is Second Dimension playing with fire? Both of them are. The "four ellipses" logo in the lower right corner is assuredly also covered. For a better idea of what you can probably get away with, maybe better to see what a slightly bigger fish like Hyperkin does. e.g. their SNES Mouse imitates the colours and fonts but none of them is a direct copy. A lot of their products have similar imitations of style without really getting very close to a copy-paste. 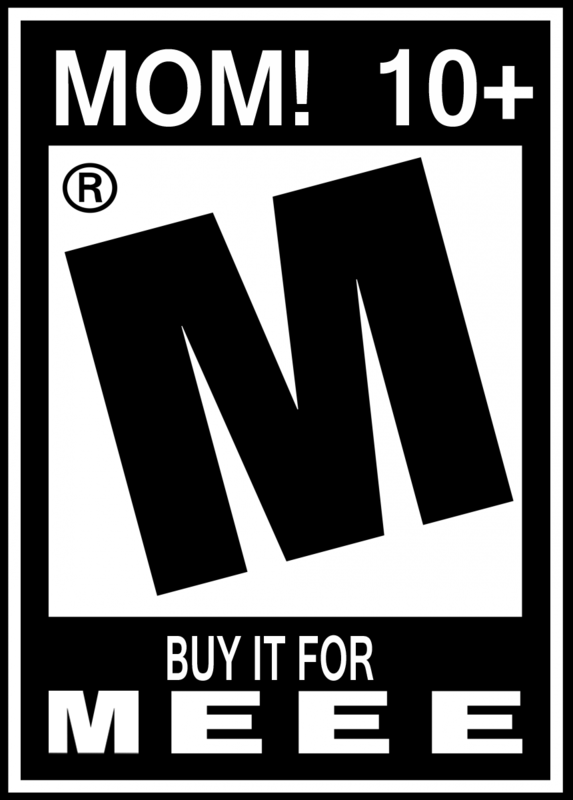 On a side note, none of this should apply to the The Entertainment Software Rating Board labels, right? Could I use something like this without problems? Last edited by olddb on Thu Oct 04, 2018 4:33 pm, edited 1 time in total. No, that's the same problem. If it's remotely conceivable that a person could mistake it for the real thing—and in this case that's kind of the point—and it's used on a thing where the real thing would make sense, then it's going to be problematic. The problem with this idea is that people have different levels of threshold in the department of mistaking things. For example if a kid wants some pokemon toy, a parent could mistakenly buy a digimon or yugioh toy by accident. Don't muddy the water. It's perfectly clear what's meant in this context. These things are unambiguously aping existing trademarks. Quoting only the first half of what I said omits an equally important part of the test. Now I see even Capcom with the re-print went super safe.